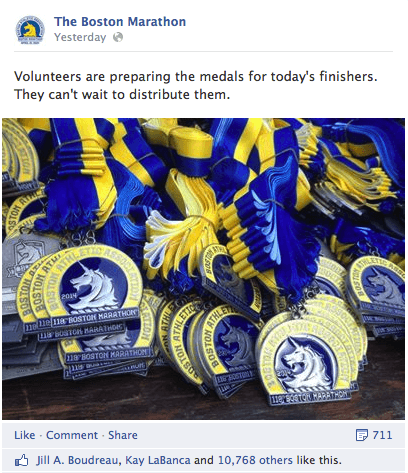 With the eyes of the world on the Boston Marathon this past Monday, The Boston Athletic Association leveraged social media to bring people together, while communicating important race information. From providing real-time race updates, to commemorating this year’s marathon as one of remembrance and celebration, here are a few social media content highlights from the event. The Boston Athletic Association, or BAA, hosts a number of races and events throughout the year, including the Boston Marathon. 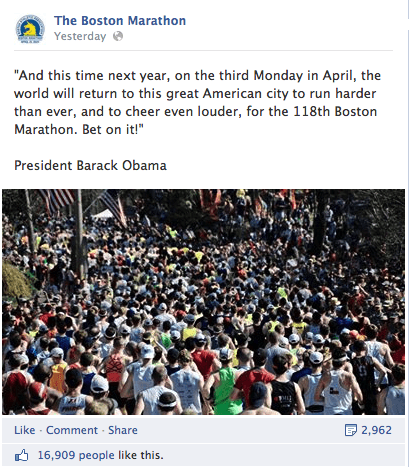 Leading into the event and on April 21st, the BAA used Facebook and Twitter for official Boston Marathon communications. On Facebook alone, more than 110 posts were shared throughout the day. The posts featured a mix of quotes, stats, photos, and other timely updates from the wheelchair and elite runner’s progress, plus inspirational moments from the athletes. 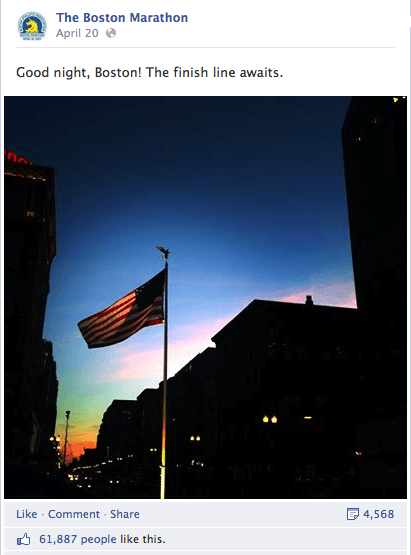 On the night before the Boston Marathon, the response to this well-composed image highlights the excitement for the race. The very first post of the day appropriately came from President Obama. Lightweight visual posts like this one were shared throughout the day to share the many different moments and stories happening. Major announcements were communicated with visuals in real-time to make for a highly shareable content. Another example of small, but powerful moments told through visual storytelling. 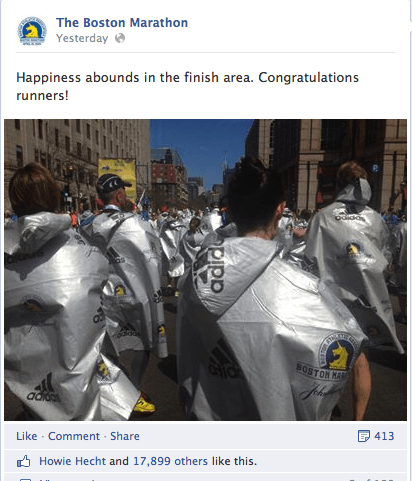 Visuals also served as inspiring images to bring runners and fans together. All in all, this Boston-based writer viewed these social media efforts as very successful. 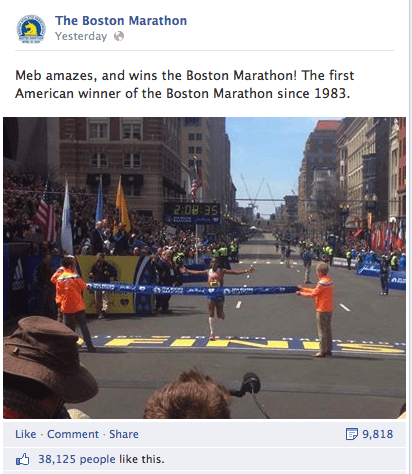 The Boston Athletic Association was able to create a real-time social media communications hub for the event focused on the participants and spectators. Sharing over 100+ posts/tweets over the course of a day is no easy feat, but their efforts and communications made the BAA’s Facebook posts and tweets the go-to source for official information. Throughout the event, the mix of content was well thought-out and timed according to what was most relevant at the moment. Time-sensitive status updates for the wheelchair or elite runner’s progress were communicated via text-only updates, with athlete pages were tagged on Facebook. Visuals were incorporated into behind-the-scenes and inspirational moments, allowing folks who could not get close to the course or finish line a sense of what it was like to be there. 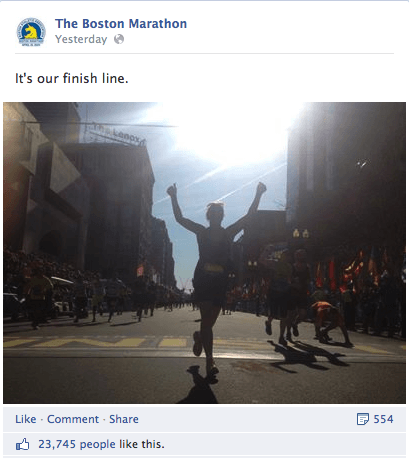 While not every story could be captured through official Boston Marathon social media channels, the beauty of this event is how people, reporters, and even companies along the course were also sharing their experiences and stories. From the Corcoran family crossing the finish line together, to finish line proposals, or four runners helping a man about to collapse get close to the finish line, the day was filled with powerful moments that brought people together. Here’s to an incredible 118th Boston Marathon and many more to come.